The Railroad Street Bridge in Bellefonte is one bridge that is considered to be in poor condition and the county is looking to improve it with the help of a state grant. BELLEFONTE — The county is using multiple funding sources to fix infrastructure projects. That includes some liquid fuel funds to help Gregg and Liberty townships with much needed road repairs. At their Nov. 6 meeting, the county commissioners agreed to put the plans on the Tuesday, Nov. 13, consent agenda. The commissioners agreed to approve payment in the amount of $15,000 to Gregg Township for completion of safety improvements on Blueball Road. They also approved payment in the amount of $59,988 to Liberty Township for paving and shoulder improvements on Railroad Street in the community of Eagleville. Liquid fuel money comes annually from the state Department of Transportation to fund a range of projects to support construction, reconstruction, maintenance and repair of county roads, streets and bridges. The fund is generated from a tax on liquid fuels, such as gasoline. These two new projects will be just the second and third checks issued for liquid fuel funds, as this year's rainy season has held up many projects. The county also looks to approve the payment of $100,000 from Act 13 At-Risk Local Bridge funds to help Snow Shoe Township fund the replacement of the T-325 Gorton Road Bridge. The anticipated project completion date is Friday, Nov. 30, with a total estimated cost of $420,000. This allocation was approved by the board of commissioners on Oct. 10, 2017. “I have to tip my hat to Snow Shoe Township, they do it right. They identified their project, they have been aggressive on how they approached it. ... This is a good example of how municipalities deliver these infrastructure projects,” said county planning assistant director Mike Bloom. The bridge was considered structurally deficient and will be upgraded to fair or good. “You are looking at basically a brand new bridge sitting up there,” Bloom said. The Act 13 funds are set aside to fix county bridges affected by the natural gas industry. The county also plans to apply for state money for multimodal transportation funds from PennDOT. The county is looking at three options: the Mill Street Bridge in Howard Borough, the Railroad Street Bridge in Bellefonte Borough and the Eagleville Road Bridge in Liberty Township. Bloom said the Mill Street Bridge is in poor condition and provides sole access to eight homes and one or two businesses, as well as a boat launch to Bald Eagle State Park. The cost of that replacement would be around $1.5 million and includes an installation of a temporary access road during construction. The hope is to receive a $1 million grant for the project. 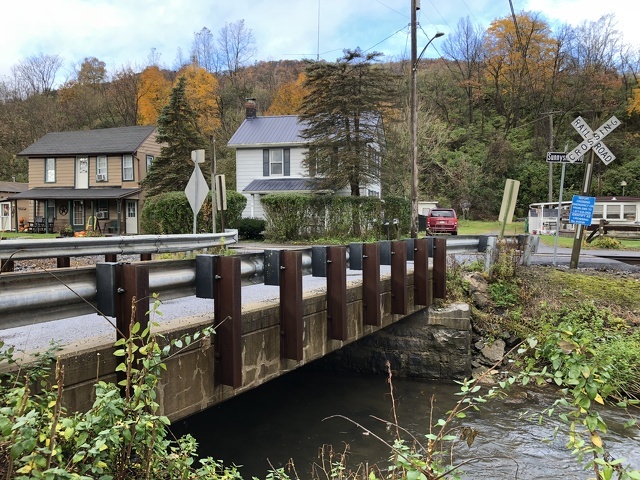 Bloom said the Railroad Street Bridge in Bellefonte is in a situation similar to the Howard bridge, in that is the sole means of access to about 10 homes and a stream access. The bridge was built in 1925 and listed in poor condition. The replacement cost would also be around $1.5 million, including the cost of installing a temporary access road for the residents affected. The Eagleville Road Bridge is the longest locally owned bridge in Centre County at 213 feet and is primary access to Eagleville for about 30 homes. The current condition is borderline to fair, according to Bloom. The bridge needs repairs instead of a rebuild, and that would cost $1 million to $1.3 million dollars. Because of its slightly better condition, Eagleville, would not be eligible for Act 13 funding like the other two poor-condition bridges. Bloom said it does have some lifespan left compared to the others, but the hope is to try catching it before it gets to a critical condition. Bloom said another option would be to include both the Howard bridge and the Bellefonte bridge as a “swing for the fences options” in order to fix the two area bridges that he feels are most critical. The grants all would need to include a match from the county that could come from other funds. Bloom said he is unsure if PennDot will award the county money having just been granted a multimodal grant. The county commissioners plan to discuss the options further in order to make a decision on which to include in the grant application.